Schnauze, es ist Weihnachten by Karen Christine Angermayer. Soja has designed an Advent calendar for Bruno – all by herself! There is no chocolate inside but something sooooo much better! Well, Bruno didn’t like day one all too much. But today is day two, he’ll like that one. What do you do when you have absolutely no idea what to gift to the other? Especially if it’s supposed to be perfect? International book time – haven’t done that in a while. However, I thought I’d share one of my favourite holiday books of the past years with you even if it’s not available in English (quote translations by me). 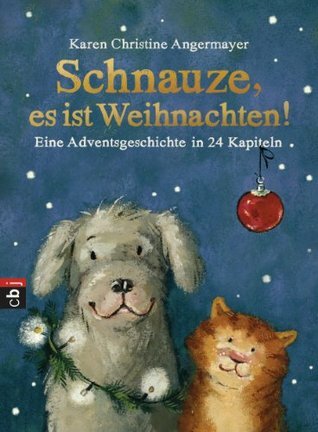 The title in German has the wonderful ambiguity that “Schnauze” refers to an animal’s snout but is also used as an exclamation to shut up. So you can read it as “Shut up, it’s Christmas”. The book is divided in 24 chapters so you can read them as an Advent calendar until Christmas Eve (which in the evening has the main event in terms of presents in Germany). And the first time around, you get to open up the pages because they are bound in a special way that seals the individual chapters. The story is simple yet complex and very, very heart-warming: Bruno, the dog, is very happy and content with his lot. Until Soja arrives at his house to spend the time until Christmas as her family is going on a trip. Soja is different from Bruno in every other way imaginable. You see the problem is … Soja is a C.A.T.! In the same house as Bruno! And not only that, she is also into such ridiculous things as sports, healthy eating, and she talks all the time. Conflict is sure to follow. How Bruno and Soja survive the 24 days in December, how they argue and fight, find differences and similarities, and finally even develop an understanding and friendship that will support them for another couple of books is such a wonderful tale that I return to this book every Christmas season. Even if I no longer have the pleasure of getting to cut open the pages. But the humour and love and the beautiful illustrations that fit so well to the characters and their friendship adventure delight me each time anew. I wish you all a very happy Christmas, a wonderful time with loved ones, and lots of fulfilled wishes, if you celebrate. In any case, have a great time and let me know which books you wish for or discovered in the comments. Interesting. My German is nonexistent so this one will have to remain a mystery to me. This week I am featuring Now That You Mention It by Kristan Higgins. Happy reading! It's better to not be perfect in gift giving. Too much pressure. Better to be thoughtful. I'm with Alice. Better to be thoughtful, have meaning:) Sounds like a wonderful book.